As the first week of school is approaching for many college students, I wanted to share a few tips to help you start the semester off on the right foot. I am a firm believer in staying on top of your work from the beginning of the semester in order to save yourself as much stress as possible. This is important to do so you have a rough outline of what your semester will be like. I prefer a hard copy because I just put it in that binder for the class and always have it with me! It is also great if you want to highlight anything important such as the professor’s office hours or a big due date. The first week is the perfect time to figure out what textbooks you actually need, as well as buying a folder or binder for the class! I have talked about how crucial a planner or calendar of some sort is on the blog so many times before that I won’t go too far into this one. 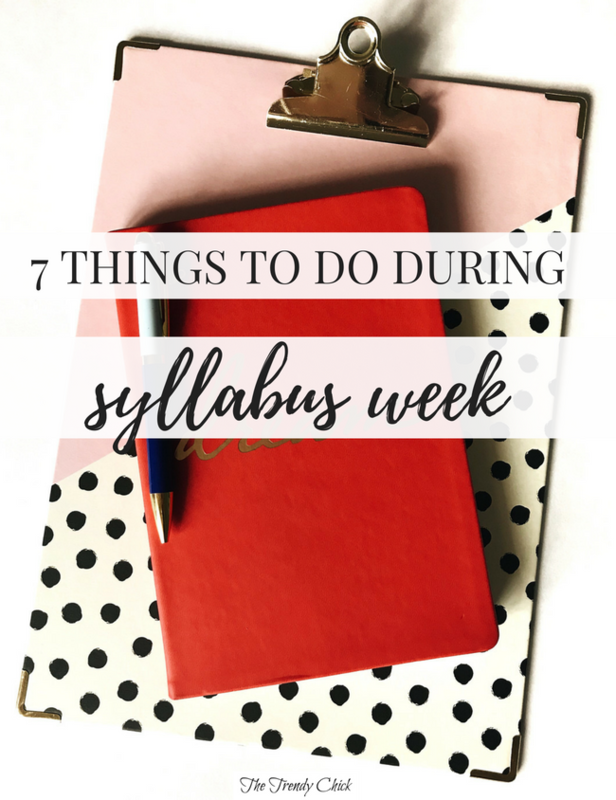 But take the time during your first week to write down any dates for assignments, papers, and projects into your planner so it is all in one place! Chances are the first week of the semester will be one of the most free weeks for you and your friends. Take advantage of this by planning fun things with friends, but also try to make a new friend or two in your classes! This is especially important if you don’t know anyone in a class because you will want a buddy to be able to text if you miss class and need notes. Or just having a study buddy can make a boring class a little better! You might be like chill, it is the first week I have plenty of time. And you are right. But getting into a routine while your schedule is a little lighter is always a good idea! Especially if you have a gym buddy, set the days you are going to go together each week and start it out from the beginning of the semester. I find if I have been going consistently since the beginning of the semester I am less likely to skip going. Everyone has their own way to organize files, but make sure you have a good system before the semester starts! I have a school folder and within that I have folders for each semester and within those folders for each class. Sometimes I have even more folders for each class if needed! I also recommend getting rid of any old documents you don’t need before the semester starts just so you don’t start out with unnecessary clutter! Writing your goals out at the beginning of the semester will give you something to strive for even when the semester gets rough. In addition to setting academic goals, set a few personal goals too! Try to learn a new skill, improve at something you already do, etc. How do you prepare for a great semester? Let me know in the comments!